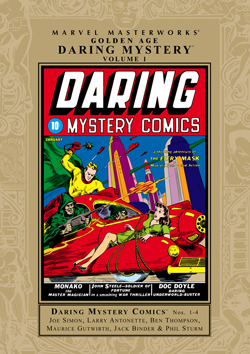 Following the phenomenal success of Marvel Comics #1, Timely released its second super hero anthology- Daring Mystery Comics - in January 1940. 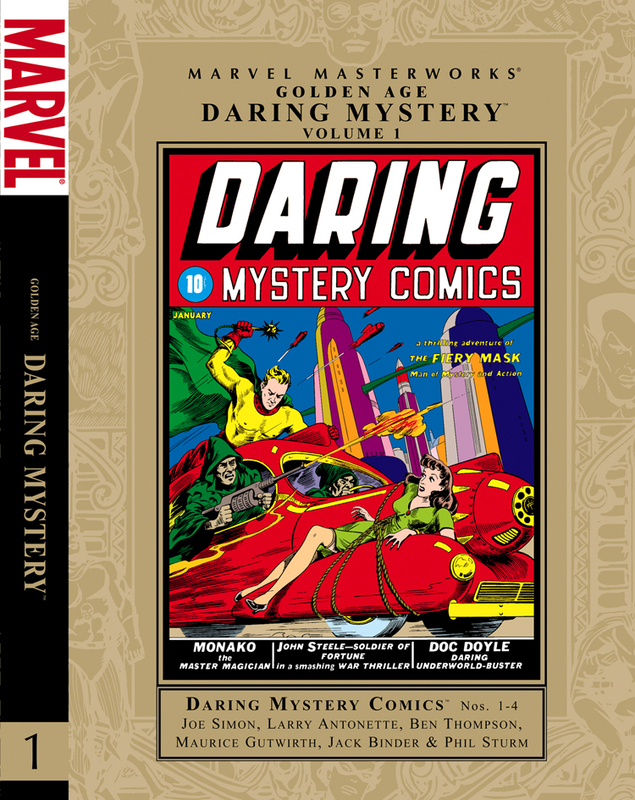 This hardcover collection remasters and restores these early adventures that introduce brand new characters into the Marvel mythos (several of whom will be appearing in The Twelve by J. Michael Straczynski & Chris Weston). See the startling introduction of the Fiery Mask where he faces the fantastic thriller of the walking corpses. Soldier of fortune John Steel sneaks behind enemy lines. The Phantom Bullet, scourge of the underworld faces off against a dastardly band of Head Hunters. 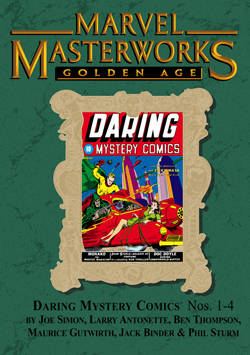 District Attorney Dennis Burton decides to take the law into his own hands as the Laughing Mask and then later as the Purple Mask. Meet the Phantom Reporter - cub reporter by day...scourge of the underworld by night. 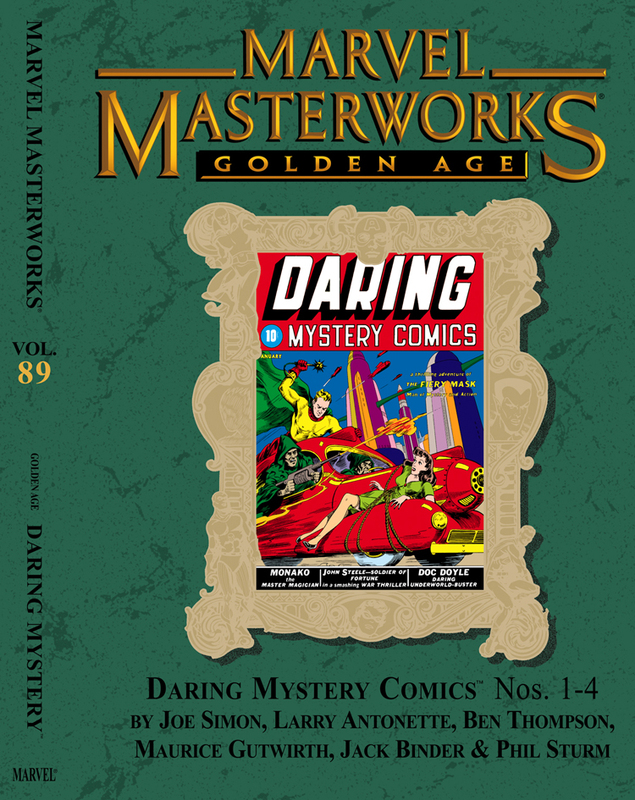 Plus: The Texas Kid; Monako, Prince of Magic; Flash Foster, Phantom of the Underworld, Barney Mullen, Sea Rover; Zephyr Jones and his rocket ship; Trojak the Tiger Man; Captain K-4 and his Sky Devils; Mr. E; Dale of the FBI; Breeze Barton in the Miracle City; Marvex the Super-Robot; Captain Strong of the Foreign Legion; Whirlwind Carte of the Interplanetary Secret Service; and more!